You've heard of smartphones, now Nissan gives you a smart house. 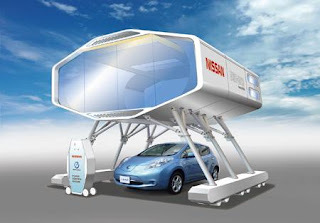 The brand has showcased their NSH-2012 "Smart House of the Future" at CEATEC Japan. The house was designed with Leaf owner in mind and features an aeroplane-inspired monocoque construction that is part of a 'smart' community, that unites eco-friendliness with easy living. With that in mind, the house has solar panels and a fuel cell system. Furthermore, a Leaf home charging system allows the homeowner to use the Leaf as a generator during emergencies, like power-cuts.